If you are planning a move to the Midwest there is only one city to consider: Columbus, Ohio. 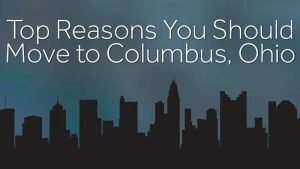 One of the nation’s leading draws, Columbus is becoming the one destination city being sought after by young and old alike. Most people know little (if anything) about Columbus. So, what does this city have to offer that is drawing newcomers by the thousands? A thriving metropolis, Columbus is being touted as the San Francisco of the Midwest thanks to its eclectic array of urban offerings. From its mouthwatering food (this city is one of the food hubs of the nation), to its thriving business community (the unemployment rate is 2 percent lower than the nation’s average), and its abundant social and family fun offerings, Columbus truly is a city that has it all. Vibrant nightlife. The Short North section of the city is bustling with activity. Featuring an avenue of bars, restaurants, and shops. Anyone looking for fun and good eats usually ends up here. Vibrant arts scene. Art galleries like the CMA, our stunning theaters, and music — Columbus is jam packed with artsy activities. Nature escapes. With some of the country’s most beautiful parks gracing its boundaries, like High Banks Metro Park, Columbus even offers a landscape version of A Sunday Afternoon on the Isle of La Grande Jatte in its Topiary Park downtown. Plenty of sports. Columbus loves sports! 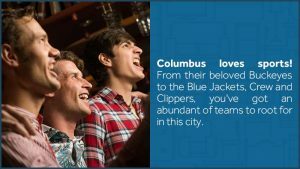 From their beloved Buckeyes to the Blue Jackets, Crew and Clippers, you’ve got an abundance of teams to root for in this city. There are a lot of things that makes Columbus stand out. For one, this city is smart! Columbus was named the 7th smartest city in the world thanks to its many colleges, universities, libraries and other academic offerings. It’s also pretty big, the 15th largest city in the country, to be exact. Roughly 822,000 residents call Columbus home, and you could be number 822,001! Columbus’s job market is bustling. The unemployment rate is pretty low here – about 2% lower than the nation’s average. With hundreds of large corporations housed here, including an abundance opportunities in the medical and fashion fields, Columbus is a job seekers dream. And once you get the job, you won’t have to worry about spending all of your paycheck on rent. Despite its popularity, the cost of living remains relatively low here. This is a great time for newcomers to invest in property since the more people seek out the city, the more opportunity there will be to build a profit. And last, but definitely not least, Columbus is such a friendly city! The people here are unmatched when it comes to their welcoming inclusive attitudes. Walk down any street and be greeted with a smile and a wave. Considering a big move to the Columbus area? You will want to make sure that your transition to a new home goes smoothly. Don’t trust just any movers with your most prized possessions. Contact Zippy Shell to see how easy it is to store and move all of your belongings. To make the process easier, Zippy Shell will also store the things you don’t need right away until you have time to unpack all of those boxes. For a limited time, Zippy Shell is offering a $20 discount on monthly rentals for those moving to Columbus. Call now for details!